I get the most compliments about my hair when I've rolled out of bed and pulled it all into a dirty topknot. Personally it's not my favourite look because secretly I know the real reason I've chosen to wear my hair up isn't because it looks nice but because it's well overdue for a wash and frankly I couldn't be bothered. (I'm a gross human being, deal with it.) To make me feel a little bit better about the hair I loathe while everyone else seems to love, I've been wearing adorable bows just below the top knot. I'm not usually one to accessorise, I have a bad habit of forgetting to wear my own jewellery, but there is something sickeningly cute about wearing bows in one's hair. these bows are my absolute favourite! I originally bought them in my school colours and then I just started collecting them. super cute! Bows are so cute! I'm not much of a bow person myself but it looks so cute on others! I love bows, I have a blue one from AA and even though my mother tells me it doesn't suit my blonde hair, I LOVE IT and yours is super cute. I also don't wash my hair often. 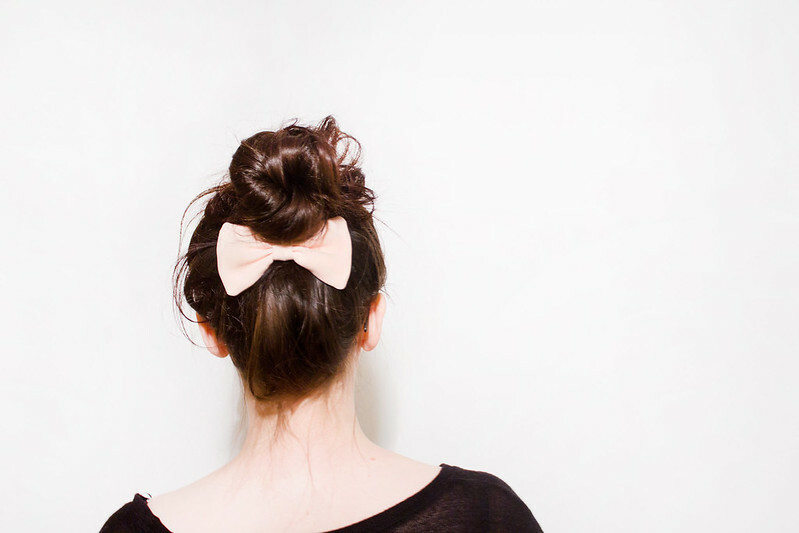 A cute lil bow can add so much to a do. Just bought a few more today, love them ! Haha, YES! I totally agree! I have some black ones I use in the same way. I like them because they're a bit more discreet, but I loove the one you're wearing! This is so cute, might give it a try! So simple, yet so nice! I'll be trying this, but it probably won't look as good.